Visit our 'Photos and images' page to see aerial footage of the project under construction. A project Facebook group has been established just for local residents and stakeholders, to provide you with project information and updates. You can find the group at www.quu.com.au/lowood-fernvale-group. Queensland Urban Utilities is committed to excellence in water and sewerage services that meet the evolving needs of our customers and enhance our communities. As part of this commitment, we’re investing $45 million to upgrade the sewerage system for the towns of Lowood and Fernvale, located in Somerset Regional Council, South East Queensland to cater for future growth and development in the area. Lowood sewage treatment plant – to be constructed on Forest Hill-Fernvale Road, Vernor, consisting of a three storey treatment plant, vehicle access, a ring road, a number of buildings, tanks and related infrastructure. Lowood sewerage pump station - to be built at the site of the existing Lowood sewage treatment plant on Forest Hill–Fernvale Road (near the intersection with Prospect Street), Lowood). This pump station will transfer sewage to the new Lowood sewage treatment plant. Ferny Gully sewerage pump station – to be located off Carralluma Crescent in Fernvale, to transfer sewage from Fernvale to the new Lowood sewage treatment plant. Lowood rising main - 1.6 km of underground sewer rising main connecting the new Lowood sewerage pump station to the new Lowood sewage treatment plant. Fernvale rising main - 6.4 km of underground sewer rising main connecting the new Ferny Gully sewerage pump station to the new Lowood sewage treatment plant. Decommissioning the existing Fernvale sewage treatment plant, Lowood sewage treatment plant, Lowood sewerage pump station and Bank Street sewerage pump station. Construction is underway and is due to be completed within two years, weather and ground conditions permitting. Work will take place from Monday to Friday, 6am to 6pm, in accordance with Somerset Regional Council approved hours of work, with occasional Saturday work if required. We will keep customers and commuters informed about progress and provide regular construction updates for directly impacted residents. construction-related noise and dust from vehicle movements, reversing safety beepers, excavation and backfilling activities. possible trimming or removals of trees in accordance with relevant Council permits. using approved traffic management schemes to ensure the safety of road users, pedestrians and Rail Trail users. Please take care and observe all signposting, speed limits and any directions given by traffic controllers when travelling through the area. Traffic management will be in place throughout the project to keep the Brisbane Valley Rail Trail open during construction and ensure the safety of users. The project team is committed to minimising the construction impacts on local residents. We will keep you informed about progress and provide regular construction updates for directly impacted residents. We will also work closely with the project contractor to ensure every effort is made to keep any disturbances to a minimum. At any time during the construction, you can contact the project team on 1800 071 230 (24/7) if you have any questions or concerns. If you would like to receive regular email updates about the project, please register your interest by emailing Community.Feedback@urbanutilities.com.au with the subject heading ‘Lowood-Fernvale Updates’ and provide your name, email address, contact number and property address. Thank you for your patience during this essential work. An existing sewage treatment plant and pump station, located on the Forest Hill–Fernvale Road near the intersection with Prospect Street, Lowood, currently service Lowood. Fernvale is serviced by its own sewage treatment plant and pump station. 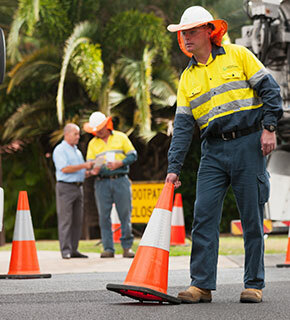 The Lowood-Fernvale sewer upgrade will provide double the capacity of the existing system and service approximately 8,800 people in the towns of Lowood and Fernvale, located in Somerset Regional Council, South East Queensland. Project Fly Through - see the full project alignment in one short video. Thrust boring pipes under Forest Hill Fernvale Road for future connection to the Lowood Sewage Treatment Plant. Construction site signage at Lowood-Fernvale Sewer Upgrade. Somerset Council Mayor and our CEO at turning of the sod. Location of new sewage treatment plant in Vernor. The Lowood-Fernvale Sewer Upgrade fact sheet can be found here. 27 March 2018 - The Lowood-Fernvale Sewer Upgrade project start of construction notification letter can be found here. 21 May 2018 - The Ferny Gully Sewerage Pump Station start of construction notification letter can be found here. 29 May 2018 - The Ferny Gully Sewer Rising Main start of construction notification letter can be found here. 18 June 2018 - The Ferny Gully Sewer Rising Main progress to Brisbane Valley Highway notification letter can be found here. 17 July 2018 - The Ferny Gully Sewer Rising Main progress to Forest Hill Fernvale Road notification letter can be found here.